In a small bowl, combine chopped cilantro and garlic, chiles, oregano, lime zest and juice, vinegar and oil, whisking to combine. Season to taste with salt and pepper. 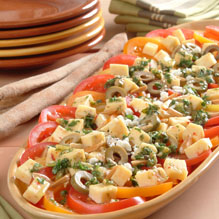 Arrange sliced tomatoes on platter or plates. Scatter cubed Pepper Jack over tomatoes and drizzle with dressing. Top with crumbled Cotija or Feta, almonds and olives.